all over the surrounding country as a man of ability, industrious, and a citizen of true worth. Mr. Powell is a son of James E. and Mary (Carter) Powell, and is a native of New York state, born in Madison county, April 14, 1864. He was the fourth of seven children, and has five brothers and one sister in Nebraska. The mother lives in Riverdale, Nebraska, at the advanced age of seventy-four years. The father died, November 13, 1880, in Merrick county, Nebraska. When three years of age, our subject went to Clinton county, Iowa, with his parents, where they lived two years, farming, and in September, 1870, the family came overland in company with George D. Moore and family to Merrick county, Nebraska, and the Powell's homesteaded eighty acres, three and a half miles west of where Central City now stands Russell Powell engaged in farming. On October 22, 1884, he was married to Miss Francis L. Prouty who was born in Wisconsin, and who came with her parents to Nebraska in 1868. Mr. and Mrs. Powell have had five children : Florence M., J. Edwin, Ray, Harold and Roy Elmer, all of whom reside under the parental roof, and an infant, deceased. Mr. and Mrs. Roy Elmer, all of whom reside under the parental roof, and an infant, deceased. * Mr. and Mrs. Powell have passed through the early history of Merrick conuty, and are widely and favorably known. Mrs. Powell's parents, Mr. and Mrs. Ira Prouty, live in Rogers, Arkansas, as do also one brother and two sisters. Two sisters reside in St. Louis, Missouri, and one is deceased. In 1889, Mr. Powell assumed the management of the J. M. Chadwick feed and sale ranch, where he lived five years. He later, at various times, purchased three hundred acres of land in Merrick county. In March, 1910, he retired from the farm, moved to Central City, and purchased a good home, where he now lives. Mr. Powell served in the school board of district number eight for six years. Mr. Powell is Past Grand and Past Chief Patriarch in the local Odd Fellows lodge, and is also a member of Masonic lodge and Modern Woodmen of America. * These repetitions appear in the book.. It was not always the poor of Europe that sought the shores of America - men who were impoverished in the crowded east, and came to the new world to improve their conditions - for the wealthy and cultured often found the name of liberty a guiding star, lighting their path to the west. Of such was the family of John J. Lenger. He was born in Bohemia, and came of a family of wealth and influence, receiving a superior education, and attained to the dignity of judge in the courts of his native country. A remote ancestor was a German who settled in Bohemia, fell in love with a Cech maiden, and for generations a German name has been handed down to their descendants. Religious persecutions made life nearly intolerable in the old country when a new dynasty came into power, and the Lenger family, of the John Huss Lutheran faith, felt the onus of this persecution, and so strong became the desire for religious liberty that, foregoing all the prestige of wealth and position, our subject turned his back on his native land, and, accompanied by his family, set out for the new world in 1865. His wife, Katherine Dulesh, although of Bohemian birth, was of French and English ancestry. Her great grandfather, was a wealthy member of the English gentry, had frowned upon his daughter's love for a young Frenchman who had visited England on matters of business, and, while seemingly acquiescing, the young couple made their plans, he going to Bohemia, where he had a comfortable estate and the girl following soon after, their marriage taking place then. After some years, her father visited them, and, finding them so happy and comfortably situated opened his heart and purse strings by buying them lands, etc., and departed, happy in the knowledge that his child was so contended and well settled in life. Mr. Dulesh afterward became governor of the province in which he lived in Bohemia, and lived to be one hundred and ten years old, dying on his own estate in that country. Our subject was versed in all the arts and sciences, and included in his education was a thorough knowledge of forestry and surveying, the latter vocation standing him in good stead as it fnrnished him a means of livelihood in Dakota at a time when money was hard to get, and the farm failed to yield enough to pay for the seed needed the following year. On coming to America, his wife stipulated that they make the voyage in a steampship and Mr. Lenger accordingly engaged passage, but before time came to sail, the ship was disabled, and they had their passage money refunded and were obliged to embark in a sailing vessel. On the voyage, terrific storms swept the sea and all the masts of their vessel were carried overboard. Although disabled severely, they finally made port, after a rough trip, lasting sixteen weeks. On landing they learned that the ship on which they had intended sailing had been lost at sea, with all on board perishing. Their own vessel had been given up as lost, and was so reported in the maritime journals. brought from his home country, but finally, realizing the necessity of choosing some occupation, came with his family to Yankton county, South Dakota, where he filed on a homestead, which he later relinquished, and acquired a tract of land situated on Beaver creek. Here he was soon appointed deputy county surveyor under Carl P. Meyer, and was later elected to fill the office as principal. While on a survey, near the James and Dakota rivers, several years later, his son-in-law, Donald Higbee, was drowned. The latter was an expert swimmer and athlete, having the distinction of saving fourteen lives in the memorable flood of 1881, but in swimming across the James river, in company with other members of the survey party, he struck a deep, cold eddy of the stream, and without a moment of warning, sank to the bottom. After coming to Nebraska, Mr. Lenger and his family endured all the vicissitudes of pioneer life, but persevered through all, and won a large measure of success, where so many others had failed. His earthly career was ended, February 12, 1907, while Mrs. Lenger's demise occurred January 20, 1904. They left eight children, who are named as follows: John, landlord of the leading hotel of Winnetoon, who is an expert musician, and leader of many bands in this part of Nebraska and now the leader of the Niobrara Northwestern Band and who organized one of the first Indian bands in the United States from the Santee Sioux; Lucy, Mary, Anna, Frank II, Flora, Rosa and Harriet, all held in the highest esteem as prominent members of society in their respective communities, the last mentioned having been assisant superintendent of the Cook County hospital at Chicago, and now lives in Omaha. Mr. Lenger was a man of great mental acumen, and his native refinement and love for the higher things of life, also his musical ability, have been transmitted to his children, all displaying the talent to a remarkable degree. Jacob N. Campbell, one of the leading business men of Fullerton, Nebraska, is at the present time filling the position of manager of the Fullerton Milling Company in that thriving little city. He has been prominent in business circles for many years in different parts of the state of Nebraska. Mr. Campbell was born in the northwestern part of Missouri, near the village of Watson, on March 31, 1865, and was the fourth child in the family of Archibald and Nancy Campbell, who were the parents of nine. Jacob was reared on the home farm, and received his early education in the country schools, later attending the high school, and also the Nebraska State Normal School at Peru. He returned to his father's homestead, taking active management of the farm for four years, at which time, 1887, he was united in marriage to Carrie L. Horn, of his home vicinity. They continued on the home farm for one year, then the place was sold, and Mr. Campbell came to Nance county, and began farming in the Loup valley, near Fullerton. He gathered together quite a bunch of stock, and remained on that farm for nine years. In March, 1898, he removed to Omaha, having been appointed secretary of the Nebraska State Commission of the Trans-Mississippi Exposition, and held the position for one year. In April, 1899, he received the appointment of assistant superintendent of the State Industrial school at Kearney, filling that position for one year, then became superintendent of the school, remaining as such for one year. He then returned to Fullerton and established himself in the harness business, which he carried on for about five years. In August, 1905, he was placed in charge of the Farmer's Elevator company in Fullerton, and continued as its manager for two years, and put the organization on a sound and successful basis. He became manager of the Fullerton Milling company in August, 1907. He has also been active in public life, holding different offices within the gift of the county. During 1891 and 1892 he was county supervisor, and in the fall of the latter year was elected to represent the 18th senatorial district, serving for one term, then was re-elected and during both terms won much approbation for the work he did in the interest of his section of the state. During the presidential campaign of 1896, Mr. Campbell was prominent in the democratic party, being chosen to cast an electoral vote for Bryan and Sewall. Mr. and Mrs. Campbell have a family of six children, all living and they enjoy one of the beautiful homes of their city. The children are named as follows: Valore P., Harry L., Archie W., Joel W., June Bryan, and Marjorie B., and together they form a very interesting and happy group. The venerable gentleman whose name is the title of this article is one of the early builders of Holt county and now lives retired at Atkinson. He is a native of Rutland county, Vermont, born November 12, 1832, son of Selah and Lydia (Fennel) Moulton, the parents both also natives of Rutland county. The father was of Irish descent, his ancestors having come from northern Ireland a generation or two before. He died at the age of fifty-eight years and his wife at seventy-four. In 1834 the family removed to Licking county, Ohio, and there Charles was reared and received his education. county, Iowa. He rented land about a year, then purchased eighty acres of good land, and when not working on his farm worked at his trade in Hamilton. He lived there until 1876, when he moved three miles north to Bussey, through which town the railroad had passed and where there was a station. At that time there was no station at Hamilton. In the fall of 1877 Mr. Moulton moved to Indianola, Warren county, Iowa, and six mouths later removed to Palmyra, in the same county, and thence in 1883 to Atkinson, reaching the last-named town in March. His first night's experience there was not very pleasant - he and a friend were given beds on the floor, as the hotel was very crowded, and when they awoke in the morning they beheld the entire floor covered with lodgers and one man occupying a barber chair as his couch. Upon locating in Nebraska Mr. Moulton filed on a homestead eight miles north of Atkinson and later purchased a timber claim south of the town. In June, 1910 he filed on an additional two hundred acres of land twelve miles south of Atkinson, which he was able to do under the Kincaid law. After living seven years on his first homestead he moved to the timber claim where he had erected a comfortable residence. During much of this time he followed his trade, while his sons cared for the farm work. In 1906 he was able to retire with a competence and has bought property in the town. The first place he purchased in Atkinson he sold in March, 1910, and purchased his present home in the southern part of the town where he and his good wife enjoy the fruits of their former toil and take pleasure in meeting their friends. Mr. Moulton's marriage occurred in Newark, Ohio, September 23, 1853, when he was united with Charlotte Cordelia Phillips, a native of Livingston county, New York, born May 23, 1831, daughter of David and Charlotte (Gilbert) Phillips natives respectively of Massachusetts and New York states. The father was born in Bristol county, Massachusetts, and lived to be 75 years of age. The mother, who was born at Bristol, New York, attained the age of ninety six years. The family moved to Ohio in 1855, Mrs. Moulton having preceded the others in 1851. Mr. Moulton and wife became the parents of four children of whom but two survive, namely Orrie, living on a farm four miles south of Atkinson, and Roy, who lives with his parents when not working at his trade. Both learned carpentry from their father, and in him they had a teacher who held them up to a high standard of work and efficieney. When the father had learned the trade it was necessary for a workman to understand many branches of it which are not generally needed in this day and generation, as, for instance, it was necessary for him to make from rough timber, sash, doors, blinds, mouldings, and other fittings and accessories now maunfactured in factories and mills and for sale in lumber yards. These parts, which were formerly made by hand, were well and substantially formed and fitted in place, with the expectation that they were built for long use. Many doors which Mr. Moulton made in the early eighties are now in use in Atkinson and as good as the day they were hung. Mr. Moulton is a republican in politics and cast his first presidential vote for John C. Fremont, having voted for the head of the republican ticket in each presidential election held since that time, and with the exception of a single one, has not since missed a state election, that occasion being when he was away from home and working in Cheyenne, being engaged in bridge and building construction work at the time the railroad was pushing through to the west, in 1868. Mr. Moulton had crossed the plains to Denver in May, 1868, returning by way of Cheyenne in December, and at that time the Indians were still hostile, so that he had many interesting and exciting experiences. At the time of the blizzard of January 15, 1888, Mr. Moulton was sick with rheumatism, leaving the feeding of the stock to be attended to by his wife, and though this was a most difficult task she accomplished it. The snow had drifted so deeply around the well that she had to dig out around the windlass before the bucket could he lowered aud raised, and it had drifted so deep around the barn that it was necessary to cut steps down to the door and clear a space away so that the door could be opened. When his claim was first occupied by him, Mr. Moulton often saw deer and antelope and at the time he crossed the plains in 1868 buffalo were still plentiful. He proceeded as far west as the "one-thousand mile tree,'' and saw the first of the seven engines that pulled into Cheyenne when the road was completed. He shared the common lot of the pioneer settler of Nebraska in fighting the prairie fires, being engaged in this strenuous work at one time from a Saturday morning until Monday noon, when he was safe from its menace, after sixty hours of danger. The hail storm of 1910 did not damage his crops, although his son lost seventy acres of corn through it. Although Mr. Moulton has never occupied a log or sod house in Nebraska, the house in which he was reared was most primitive, being built of logs and so open that it was possible for squirrels to get in and steal his horde of hickory nuts. At that time in his Ohio home the deer were so tame they often came up with the cows at night, and the black timber wolves were very often found prowling about a farmyard and preyed on the settlers' young pigs. He has been a pioneer in three states. He is highly respected as a useful, upright citizen and has always shown great interest in every movement tending to advance the general welfare and prosperity of the community. Mrs. Moulton's paternal grandfather was David Phillips, a sea-captain, who was buried at sea. David Primrose needs no introduction to the people of Nebraska. He is one of the leading men of affairs in the town of Primrose, which town was named after himself, he being one of its chief founders, and known throughout Boone and the surrounding counties as a man of broad mind, culture and ability. He is also one of the largest landowners in that section of Nebraska, and by virtue of his sterling character and. honest efforts to better conditions in his locality has gained high esteem in the hearts of his fellowmen. Mr. Primrose was born in Ireland on June 16, 1844. He was the third child in the family of William and Margaret Primrose, who had six children and grew up in his native land. When he was twenty years of age he came to America, landing in New York City, where he spent a little time, and later lived in Pittsburg, Pennsylvania. Mr. Primrose came to Boone county, Nebraska, in March, 1874, and immediately filed on a homestead in section ten, township nineteen, range eight. He also took a timber claim in the same section, and developed both in good shape. He later settled on section sixteen, which is now his home farm, consisting of half a section, and four hundred and eighty acres on section ten, all being very choice land admirably located in the Cedar river valley. Mr. Primrose is the owner of over three thousand acres of land in Nebraska, situated in Boone, Perkins, Greely and Wheeler counties. The town of Primrose was laid out in 1902, and occupies part of section sixteen, belonging to our subject, and the town was named in his honor. This is now a growing little town, and is beautifully situated on the Columbus branch of the Union Pacific railroad. Mr. Primrose was united in marriage to Belle Jane Patterson, in Dublin Precinct, in July, 1876. Mrs. Primrose was born in Ireland and came to America with her parents when a small child. She was a woman of fine character, had many friends, and was deeply mourned at her death, which occurred on the home farm, July 6, 1899. Mr. and Mrs. Primrose were the parents of eleven children all born in Boone county, and named as follows Belle G., Martha, John, William, Mary, David, Lucy, George and Sarah. Samuel and Sarah (No. 1) are deceased. The family are among the prominent pioneers of Boone county, and Mr. Primrose has always taken an active part in the affairs of his county and state, in 1908 being appointed to fill the unexpired term of county commissoner. He was urged to accept the nomination the following term, but refused on account of his extensive business interests. He is vice president of the Primrose State bank. Mr. Claus Loge, who has for the last quartter of a century resided in Wayne county, Nebraska, and during this time has acquired a fine property as a result of his industry and good management, is widely known in this locality and is held in the highest esteem as a farmer and a citizen. He has a comfortable home, pleasantly located on section eleven, township twenty-five, range three, and is regarded as one of the prominent men of the community. Mr. Loge is a German by birth, as he first saw the light of day in the province of Holstein, July 25, 1832. He received his education in his native land, and remained there during the years of his young manhood, helping his parents on their farm. He was also called upon for military service during the war between Germany and Denmark in 1857 and 1858, and served for sixteen months. In 1878, he decided to come to America, as it offered much greater opportunities for his children than could be found in the old country. He accordingly embarked on the steamer "Freesia," with his family, and made the trip from Hamburg to New York. He came first to Potawattomie and Shelby counties, state of Iowa, where he remained for about six years. In 1885, the family removed to Wayne county, Nebraska, where Mr. Loge bought a quarter section of fine land, upon which he made considerable improvements. This farm was the home of the family for some time, but it has since been given to the son, John, who now resides there. Mr. Loge himself then bought the farm where he lives, of one hundred and sixty acres, which his son Henry now owns. In 1863, Mr. Loge was united in marriage to Miss Mary Rath, and they are the parents of four children: John, Henry, Lena and Bertha, the two latter being deceased. Bertha dying in Germany. Mrs. Loge died in 1902. Among the early settlers in Antelope county, Nebraska, who has been instrumental in the development and growth of the agricultural and commercial resources of this section of the country, Charles E. Hemenway takes a leading place. Mr. Hemenway resides on a fine farm in section twenty-three, township twenty-six, range eight, Antelope county, where he enjoys the fruits of his labor of years gone by, surrounded by comfort and plenty. Mr. Hemenway is a veteran of the civil war, a worthy citizen, and a good neighbor, and richly deserves all the success which has come to him. We call attention to a view of his residence which is presented on another page. 1820, in Worcester, Massachusetts. Our subject's grandfather was in the war of the revolution, and served at the battle of Saratoga. Mr. Hemenway's ancestors came from Boston, England, three brothers of the family coming to America from England in the early part of the eighteenth century. After landing they separated, one going to Massachusetts, one to Connecticut and one to New York. Our subject lived in his native state until he enlisted in the army during the civil war, in Company C, One Hundred Fifty-Third Illinois Volunteers under Generals Thomas, A. J. Smith and Milroy. Mr. Hemenway enlisted on Christmas day, 1864, and during his enlistment served on detatched service, hunting guerrillas throughout Tennessee and in July and August, 1865, as provost guard at Memphis. He received an honorable discharge September 24, 1865. In 1867 Mr. Hemenway came to Omaha, then returned to Illinois, and finally, in 1870, came to Nebraska, and here took up a homestead in Antelope county, in section twenty-three, township twenty-six, range eight. He built a dug-out aud ''batched it" for three years. Norfolk, the postoffice was forty eight miles away. Columbus, Wisner and Yankton, the nearest market places were seventy five miles away. Like many of those pioneer settlers of this western country, Mr. Hemenway experienced many great hardships. During the years of 1874, 1875 and 1876, the grasshoppers destroyed all his crops, and many times they fought the prairie fires to save their home. During the blizzard of October 15, 1880, Mr. Hemenway acted as guide to a hunting party of twelve, from the coast; among them being: Col. Marble, aud C. C. Holton, then collector of custom at Boston, Massachusetts. The party was caught in a storm seventy-five miles west of Mr. Hemenway's place, and several were in favor of starting to back tract, but Mr. Hemenway threatened to shoot any man who would touch the horses. The next morning they started to find the nearest sod-house which was about forty-five miles away. By the aid of Mr. Hemenway's compass they were able to get within a half a mile of the sod house. On reaching this point Mr. Hemenway formed land marks which directed him to the house where they remained until the next day when the storm abated. March 4, 1873, Mr. Hemenway married Miss Elizabeth Graham, who was born sixteen miles south of Lincoln, England, May 25, 1846. Mrs. Hemenway, with her parents, came to America in 1856; coming from Liverpool to Quebec, Canada, on a sail boat. They were on the ocean five weeks. From Quebec they moved to Wisconsin, and in 1871 moved to Douglas county, Nebraska, where Mrs. Hemenway taught school until she married Mr. Hemenway. After the grasshopper raids in Antelope county, Mrs. Hemenway went back to Douglas county to teach again and help earn money to put in new crops. She being the mother of a child at that time, Mrs. Hemenway's parents cared for the infant while she taught school. Mrs. Hemenway taught the first school in district number seven. Mr. and Mrs. Hemenway have had the following children born to them: Jessie, wife of Elmer Cary, the parents of eight children; Merrit C., who is married to Josie Patros, and has four children; Archie, who is married to Anna Patros; Agnes, Stanley, who lives in Wyoming, is married to Opal Okee, and has one child; Loretta, wife of James Brown, has three children; Oliver, married to Cora Mintun, and Oscar. Another child, Dewight, was killed on Thanksgiving day in 1900, by a fall from a horse. Mr. Hemenway was a broom-maker by trade, having learned from his father in 1867-8, while in Illinois. From broom corn born on his own farm Mr. Hemenway made the first two thousand brooms which were sold in Omaha, then a town of about four thousand population. At the time the Indians stole a number of horses from the neighborhood in 1870, the settlers thought it would be impossible to cross Cache creek owing to the quicksand, but they trailed the Indians to the spot where they had crossed. When the pursuers' horses became jaded, two of the freshest horses were sent on to Wm. Inman's place where it was known they must pass owing to a widely burnt tract to the north. Sure enough they came that way, but Mr. Inman being absent, they were afraid to attack the Indians, so set the dogs on them. It was months before the horses were finally recovered. When the Indians passed Fort Randle, the soldiers knew that the horses belonged to white men and knew that they had not been bought, so they took possession and advertised in the Omaha papers. The owners recovered most of them at the Whetstone agency, but they were so thin it was hardly worth bringing them home. The Indians had ridden them nearly to death. Mr. Hemenway is a popular citizen and served his county as commissioner in 1882; he served as assessor six years, and also as supervisor three years, and was re-elected assessor in 1909 for a term of two years. Residence of Charles E. Hemenway. James W. Gould, one of the many English-born residents of Pierce county, Nebraska, who have added much to the stability and progress of the region, was born in Sheffield, England, where his father was employed in the iron mills, January 2, 1868.
came direct to Chicago, where the father stopped to work in the rolling mills, while his wife and son proceeded to Belvidere where they had kin. The father was in Chicago during the memorable fire and remained to work for a time clearing away the ruins. In the spring of 1872 they came to Nebraska, reaching Plainview April 22, located on a homestead now a part of the town, and here the father spent the remainder of his life. Our subject's parents are both deceased. The father, James Gould, was born August 13, 1827, in Staffordshire near Litchfield, England. He died at Plainview, Nebraska, February 28, 1904, at the age of seventy-six years. He was married to Ellen Rickett at Rotherham Old Church, Yorkshire, May 28, 1855. Two children, a son and a daughter, were born to them. Their daughter died in England, and the son is the subject of this sketch, at whose residence the father died. The story of the elder Gould's life would be a recital of the pioneer days that every old settler remembers. Grasshoppers came and ate his crops. Droughts and floods also performed their part in the desperate struggle for existence. But through it all he remained. Despondency and often despair settled down like a dark pall over the scattered settlements in Nebraska. Many became discouraged and moved away, but this sturdy old pioneer clung to his home and weathered all the storms of adversity. His faith in this country was justified. He lived to see eastern Nebraska become one of the richest and most productive portions of this great commonwealth. His wife, our subject's mother, who was born in Grantham, Lincolnshire, died about 1905, and now they lie side by side in the Plainview cemetery, a few blocks from where they settled thirty-two years ago. James W. Gould, our subject grew to manhood in Plainview, living the wild life of the frontier, becoming fond of hunting and fishing and at times played at cowboy, herding cattle on the open range. Mr. Gould's fondness for play when a boy came near costing him his life. He had an Indian pony and frequently carried a broomstick for a gun; his mother had sent him to a family some seven miles away to exchange squashes for some citrons to make preserves, and on the way back a settler from Hungaria, supposing from his dark complexion and aquiline features that some Indian boy was out alone, coveted his pony and gun, and took lawless means to get them. He followed after the boy with a large horse pistol, and, kneeling took arm and fired. Mr. Gould was watching him, taking no alarm until the shot was fired. Putting spurs to his horse, as soon as he rounded a sand hilll, he doubled back and saw the would-be murderer following his trail on horse-back. Sometime after reaching home, the Hungarian, returning from a long, fruitless chase, stopped at the elder Gould's and told a wild tale of having been attacked by Indians and having chased them beyond Creighton. Another incident that nearly cost him his life was an unexpected attack by a bull dog in which his face was so lacerated that hope of recovery was abandoned; his teeth were ruined and his growth was stunted for at least ten years. He enjoyed the advantage of the village school and adopted farming as his profession in life and has made a comfortable success. He began doing carpenter work in 1890, and although never regularly apprenticed, can turn out as fine work as any regular tradesman in the region. Mr. Gould was married in Madison, Nebraska, at the house of Stephen Stork, an old friend from England, November 11, 1895. The bride, Miss Wiego L. Hanson, was born in the village of Clippinge, near Copenhagen, Denmark, January 31, 1866, a daughter of Peter and Ann Elizabeth (Robertson) Hanson, who embarked at Copenhagen for the western hemisphere on the "America" and after three weeks landed in New York, May, 1870. To Mr. and Mrs. Gould seven children were born, five of whom are living: George Burnham; Harold R., Helen E., James, Jr., and Eugene Herbert, all attending Plainview schools. Mr. Gould is a republican, and is a member of the Independent Order of Odd Fellows, and Modern Woodmen of America lodges. Mr. Gould was the first white child to find habitation in Plainview, and has witnessed the wonderful development of the prairie, and has had a hand in that development. Their worst experience with prairie fires was in the fall of 1879 when it burned barns, sheds, wheat stacks and everything but the dwelling, which was with great difficulty saved. Our subject has seen the Sioux Indians in their war paint; a party escaped from the reservation, and on their way to the Ponca country were overtaken and rounded up on Willow creek and brought to Plainview, that George Burnham, who spoke French, might give the orders to them through an Indian who understood the same language and thereby get them back to Dakota. The most ludicrous Indian scare some years later filled the town with refugees some of whom took no time to dress, but came wrapped in the blankets under which they had been sleeping. After waiting long with no Indians heaving in sight, some braver than the rest rode north to investigate, and learned that the shooting was done by a party of whites returning somewhat hilariously from a charivari. Mr. Gould often passed over an old Indian battle-ground near a ranch he owns not far from Verdel, Knox county, where for years skulls and other bones thickly strewed the ground. Mr. Gould is fond of hunting and fishing and with N. M. Nelson and others frequently spends few weeks in camp in the lake region of Cherry county. only the prairie grasses waved, each year grain fields are undulating in the summer winds, and the cornfields fill the bins with a golden harvest. This is surely the land of opportunity. We are pleased to call attention to a view of the Gould's large residence on another page together with illustrations of the primitive dwelling of 1870 and another of later additions to the first small house. 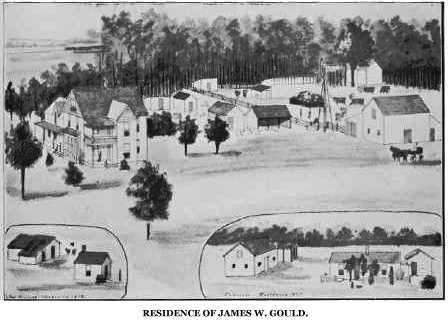 Residence of James W. Gould. Julius Zellmer, a prominent and well-known stockman and farmer of section twenty-two, township twenty-four, range one, of Stanton county, is a native of West Prussia, Germany, born in 1860, a son of John and Wilhemina Zellmer, who spent their lives in that country. Mr. Zellmer reached maturity in Germany, and there received a common school education, leaving home in 1880 for America. He sailed from Hamburg and landed in New York City, whence he came to Nebraska. He had decided there were better opportunities in the west for a young man to make his fortune, and having little money to make a start, he secured a claim from the government. He is a most industrious and persevering farmer, and has developed a good farm. He has made all possible improvements on his place, and now makes a specialty of stock raising, being successful in all lines of his work. He is well known throughout the county as a progressive and public-spirited citizen, who is much interested in the welfare and upbuilding of his community, and has the respect of all. He at first erected a small frame house, which was his home for several years, and he has since erected a more commodious and comfortable residence and various buildings for housing his stock and grain. He has a fine five-acre grove of fruit and shade trees, which add much to the value and beauty of his estate. Mr. Zellmer was married in 1888 to Miss Sophia Stangal, and they are parents of six children, namely: Emma, Anna, Adelia, Otto, Aldora and Mina. Mrs. Zellmer was born in West Prussia and is a daughter of Carl and Marie Stangal. Both she and her husband have many friends in Stanton county, and are interested in securing good educational advantages for their community. They were forced to undergo many privations in their early life on the farm, and have had the pleasure of watching the wonderful development of the region they have lived in so many years. Among the prosperous citizens of Antelope county, Nebraska, who have spent many years in this locality is the subject of this review, Jacob Wiegand, owner of a valuable estate in Crawford precinct. Mr. Wiegand was born in Villa of Berteroda, Saxony, Germany, March 28, 1849. When he was five years old, with his parents he came to America. His father was William Wiegand, born July 21, 1809; married in 1844; died September, 1882. His mother, Katherina Wiegand, was born June 17, 1817, and died July 18, 1900. Our subject's father was a farmer in Germany, and in 1854 with his family left their native land and came to America to find cheap land and make a home. They left Bremen on a sailboat, the Nebraska, and experienced a severe storm at sea, the mast of the boat was broken and they thought they would all be lost. They landed in New York where they stayed a few days, then started out to see a brother of the father who lived in Rock Island, Illinois, and got as far as Chicago and were delayed there six weeks until the railroad was built as far as Rock Island; remained there for fifteen years, then started for the far west, as they thought in those days. They drove from Rock Island to Dodge county, Nebraska, and took up a homestead in 1869 and lived there eighteen years. Fremont, Nebraska, was the market place, which was twenty-six miles from the claim. He built a small frame house at first, but added to it as he prospered. The grasshoppers took all the crops the first six years, and they suffered greatly during the blizzards of 1873 and 1888; they also suffered from hailstorms and hot winds. Our subject's father and family, like a great many other early settlers experienced many hardships, but through all of this they prospered and came to the front. In early days they had to burn hay, sunflowers, and cornstalks, and it took one to feed the fire all the time, the rest to bring in the fuel. Antelope, deer and wild turkeys were very plentiful in those early days. On April 28, 1874, our subject was married in Pebble precinct, Dodge county, to Miss Henrietta Wilhelmina Schmudo, who was born September 2, 1855, in West Prussia, Germany. She came to America when she was a little girl five years old with her parents Gottlieb and Anna (Walter) Schmudo, from West Prussia, fifty miles from Berlin. They caine to America in a sailboat. Mr. and Mrs. Wiegand are the parents of three children who are named as follows: Julietta, M. E., born 1875, married in 1894 to J. H. Mumm and they have five children; Hilda Rosina, born 1883, married in 1909 to E. J. Harris; Walter Raymond, born 1891; William Julius born 1877, died 1878; Arthur Frederick, born 1879 died 1899; Clara Doretha, born 1881, and died 1899; she was married to L. R. Riley and lived only six weeks after marriage.